Fiona Veitch Smith talks to artist Lara Mellon about how her artistic gift turned into a ministry and a brush with death gave her a new appreciation of life. I FIRST MET LARA MELLON (OR BENDEMAN AS SHE WAS THEN) IN art class when we were 13. By the end of the year it was clear that she had the talent and I ... well, I dropped art and took up typing! Now 22 years later, we've met again through Friends Reunited, and I'm still typing and she's still painting. We were thrilled to hear that we're both Christians and serving the Lord through our respective gifts of writing and art. I'd been struggling to find the right way to start an article about my old friend, when an email popped into my in box. It was from Lara. "Dearest Fiona. 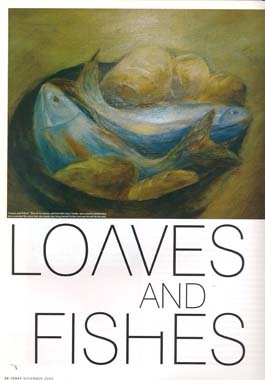 As I write to you I'm having a little break whilst painting an oil of 'Two Fishes 'n Five Loaves' for a friend. I've been battling a bit and was on my knees painting with both my hands, palms 'n all, in absolute frustration ... and yes, praying like mad ' cause I'm just about past deadline on this one ... when suddenly it took on a new (and probably its own) direction. "It isn't what I was intending, but I think probably more in line with the commissioner's taste. The whole time I'm painting this I keep thinking how the Lord asks us to bring the little we have to Him, and He does the multiplication and the miracles. We just have to be obedient with the tiny bit we have, even when it doesn't seem to make logical sense to us. It is for me a very humbling as I keep thinking, there must be a zillion billion trillion other artists who are a kazillion times more talented than me, yet the Lord keeps getting me to bring the little talent I have before Him and He seems to be blessing others with it ... hmm, on we go." I could almost see the paint smudges on the keyboard. What a timely reminder that we just have to do our little bit and God will do the rest. Although Lara had been painting and drawing all her life, it was only in 1995 when she was on a Christian retreat called The Walk to Emmaus that she realised that God might actually want to use her 'little hobby' to His glory. "It was at this weekend that I realised that the Lord does not require perfection - just honesty and authenticity and to live my life with what He's already given me. We had to do projects and I was required to do drawings. I realised that what I regarded as 'just a little bit of talent' was really appreciated and even needed by other people. I realised that it isn't about me and what I can do, but about me being obedient and therein allowing God's Spirit to touch people," says Lara. This idea of offering up our talents to God is very humbling. So often we think that our talents are for ourselves, for our own advancement, when in fact they are not ours at all. Those of us who use our talents professionally need to be reminded of this. And so do those who are too frightened to show their talents for fear of being judged harshly. But if our talents are not ours, then we have no right to withhold them from God or from others. Lara learnt this lesson after receiving a commission to paint an angel. "I was a little sceptical, and I gently explained to the lady that I don't really paint pretty fairies sitting on tulips! But she insisted and explained she needed a painting for above her bed, which would remind her that she was not alone. The painting needed to bring her comfort. I realised that the people commissioning me wanted the paintings for very specific purposes and not merely for decoration. "It was at this time that I realised my art was a ministry. Before, I had expected to produce a work then sell it to a purchaser who saw its worth. I expected that I would determine the subject matter and paint what was important for me and what interested me. But the Lord turned that idea on its head! The success of my art has been painting what other people want. I still have to interpret the commission and I still use my own style, but it serves the commissioner's requirements, not my own, and I'm blessed in the process." Lara lives and works in Durban and sells her art both locally and abroad. She has been married to Patrick for 15 years and they have two children, Andrea (14) and James(10). "Our faith is central to our family and the children both have a strong, personal relationship with Christ," says Lara. Their faith was tested to its full in August 2000 when armed robbers broke into their Durban North home. Lara and her husband were held at gunpoint while the four intruders packed up all their valuables and loaded them into Lara and Patrick's two cars. "I was so sure they intended to kills us," says Lara. "Not just because they didnt bother disguising themselves, but because that evening at 10 o'clock, I had printed the last of nearly 100 letters to friends and family members with whom I had lost touch and felt compelled to write to. I explained in my letter how gracious God had been and what a happy and complete family we were. I ended by thanking each person for the impact they had on our lives and for the difference they had made in the world. "Looking at the gloved hand holding the gun, I thanked God for the opportunity to print and seal every last letter. There was no unfinished business, and I even managed a little smile because I remembered that I had managed to pay off and close the last of my clothing accounts that day!" But God had other plans for Lara and her family and she and Patrick prayed earnestly for their lives, remembering Jeremiah 29:11 about God's plans to prosper and not harm them and give them a hope and a future. "I prayed for God's protection over my whole family and that my children would stay asleep in their rooms. Then I prayed for the men's forgiveness and for my own forgiveness for contributing to the sin of the world." Then miraculously, the robbers left, without laying a finger on either of them. Lara says that they have not been scarred by their ordeal, but have become grateful for the time the Lord has granted them to be together as a family. As a result, Lara makes every effort to include them in her work. Her studio is very much part of the house - a family place. "We're a very close-knit family and are often together in the studio doing homework, work or art. There's no 'my space/your space'." Lara says that the success and enjoyment of her marriage is that she and Patrick both enjoy serving each other. Although Patrick (an accountant) has learnt that when Lara asks for his opinion on a painting she doesn't want a 10-point list of 'areas to consider' pinned to the canvas! But Lara tells me that it isn't always easy maintaining balance between the different aspects of her life. Apart from being a successful artist, a regular speaker at Christian retreats and devoted mother and wife, she also works as a recruitment consultant for the large financial advisory firm, Deloitte and Touche. "Keeping my prayer life, daily devotional and quiet time in place is vital to maintaining harmony between all the demands of life. As much a s I like routine, my paintings keeps me spontaneous. It feeds a part of my soul. When I'm not painting or creating I'm not as nice to be around. Even if I only paint once a week, I seem to deal with stress better. I think more clearly, sleep better and work better," she says. Although she considers herself a Christian artist, she is very careful not to get caught up in a holy huddle. She is a member of a secular group called the Garrett Artists and feels very comfortable expressing her spirituality in non-Christian settings. "My faith in Christ is at the very core of everything in my life and in all of my work. My art needn't be obviously 'Christian' (with crosses, doves and so on) but even in my abstract work, the very nature and spirit of the painting communicates to the viewer all that Christiantiy is and represents. Particularly in the corporate world, I've often had opportunities to discuss a painting, which doesn't have a literal reference to Christ (but has a message of hope, direction, light and truth), and so share my faith." My painting of the archangel Michael. I have had a number of offers, but I refuse to part with him.